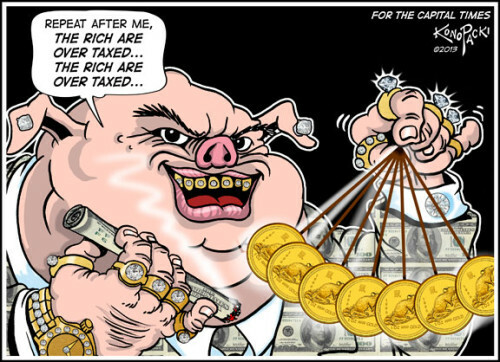 Do you really want to know how the ‘rich’ get ‘richer’? Well, you can plow through this long list at Mother Jones, or if you prefer, I’ll sum it up for you – in one word – DECEPTION. The number of ways they deceive us are legion, but the main causes can be counted on one hand. All they had to do was trick us into giving them control over our money system and over knowledge and technology through the copyright and patent system – believing that it’s FAIR, when it’s NOT. Then, one decade after another, they consolidated the nation’s resources – tangible (real property and commodities) and intangible (knowledge and technology) – and now NOTHING remains for anyone else. There isn’t a ‘progressive’ tax system in the world that can begin to ‘fix’ an economy as fundamentally flawed as ours. But, Americans don’t see it. We’re deceived. We’re our own worst enemies. What the FILTHY rich have so cleverly learned is that while it may be fun to look down on others, it’s far more fun and effective to TRICK them out of everything they’re entitled to then sit back and let them hate themselves. that’s hate speech, Stan. Horrific and unacceptable. Stan may be right. Those people have been kiked out of 150+ countries throughout history foir violent crimes and corruption against the Country and People around them. WATCH CLOSELY! When somebody is murdered that makes over 100k per year is it a jew that gets their job? When a company is takin over or ruined is it a jew involved? It is a fair question and it is logical to watch just WHO is doing the violent crimes and taking business and jobs. It is a good idea to watch and SHOUT OUT just WHO is behind law, legislation and taxation policy and rules that divide the country. And IF…MAYBE….just MAYBE it is one group of people starting too many wars and killing too many children just MAYBE we should declare war on them?….Or maybe Stan means put them on trial for treason, which the penalty is death……. Putting specific people on trial for specific illegal and egregious conduct is what the law is about. Inciting hatred and violence against an entire religious group because you think they should all be punished because a handful of criminals happen to declare that they are of the same faith is not only wrong, it’s illegal.